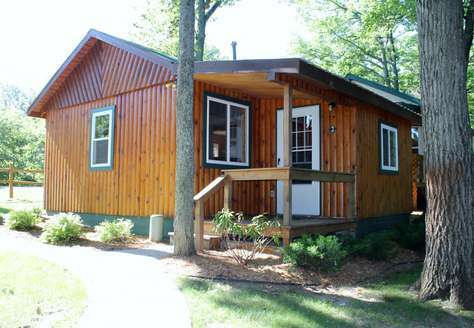 The cottage house has two bedrooms and two full bathrooms with accommodations for a maximum of six (6) adults. A comfortable living area has plenty of common area seating and a 42 inch TV with DVD player. Linens and plush bath towels are also included. The large open kitchen is equipped with a full size oven, refrigerator, dishwasher, microwave oven, electric flat griddle, coffee pot, dishes, cookware and the other accessories you might need to prepare your meals. During summer months a barbecue gas grill is also provided for outdoor cooking. Cabins #2, #3, and #4 have two bedrooms and one bathroom and will accommodate a maximum of four (4) persons. All of the cabins are newly renovated and equipped with a refrigerator, stove, microwave, coffee pot, electric flat griddle, a toaster oven, dishes, cookware, plush bath towels, linens and a 42” TV. A gas barbecue grill is also provided for outdoor grilling during summer months. Otsego Lake is a beautiful all sports lake and right outside our door. Enjoy boating, fishing or just relaxing on our shore of 120 feet of private beach. Have a cookout under a canopy of tall pine trees, play horseshoes, and watch the sunset over beautiful Otsego Lake. We have a boat dock with 6+ slips so bring your boat, or rent one nearby. Oh, the anticipation…hot sun on my face, s’mores around the campfire, playing on the lake and hanging out with family and friends… I can’t wait. Having a large gathering? Reserve all four cabins and enjoy private accommodations for a family reunion, wedding or a group getaway with your friends. Have you made reservations for your summer vacation yet? Don’t miss out. Make new friends and great memories that will last a lifetime. 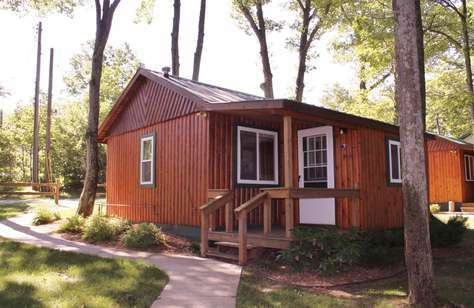 Reserve your cabins today and enjoy all that Otsego Lake and Gaylord have to offer.